Our legal name is 'The Hartford Friends of Wallace Stevens'. 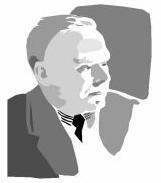 We are a 501(c)3 non-profit organization formed for the purposes of promoting the literary arts and preserving the cultural legacy of Wallace Stevens in Hartford, Connecticut, and beyond. 1) It attracts attention, as your question indicates. 2) There was a famous organization founded by Chick Austin, the former director of Hartford's Wadsworth Atheneum, called 'The Friends and Enemies of Modern Music'. This organization produced musical programs of challenging modernist composers. The name acknowledged that not everyone would like what they were going to hear. 3) Which brings us to challenging or should we say difficult: For some who knew Stevens during his life, his demeanor at times could rub people the wrong way. He could be a bit of a curmugeon and some of his co-workers were terrified of entering his office if he was in a bad mood. But beyond that, Stevens' modernist poetics, inflected by deep philosophical musings and the pressure he put on the semantic boundaries of language, can pose difficulties even for experienced poetry readers. We love that about his work, but we recognize that it can be off-putting to some. In sum, we want to welcome the 'enemies', too, into our ranks.